Welcome to a new type of review here on Space Game Junkie: documentation reviews. I’m a massive fan of manuals, strategy guides and so on, so I figured, since they’re so integral to the space game experience, why not dive in and review them too? 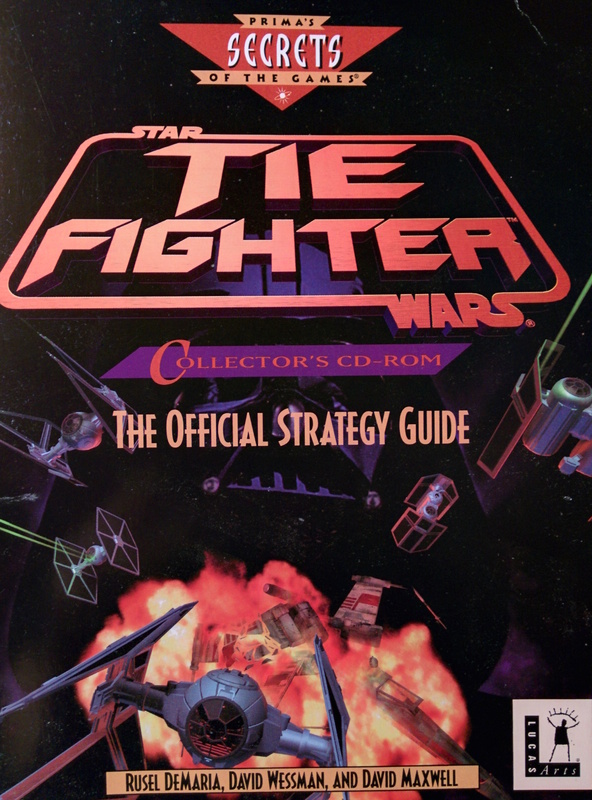 Today I start the series with a doozie, Prima’s 1995 opus, “Star Wars: TIE Fighter Collector’s CD-ROM Official Strategy Guide,” written by Rusel DeMaria, David Wessman (who currently has a Kickstarter going, by the by) and David Maxwell. This — and future — RTFM articles will try to convey how well the documentation works in several key areas, including preparing players for the game, quality of writing and additional flavor or story. Luckily, we started with a book that hits all of these and more. This review will cover a physical copy of the book, so I apologize if the pictures are a little wonky. First off, this guide is massive, coming in at a hair over 500 pages. This particular guide covers all thirteen battles found in the CD-ROM version of TIE Fighter via two expansions, however interestingly the guide calls the second expansion “Imperial Pursuit”, which is an X-Wing expansion, rather than Enemies of the Empire as it’s more widely known. Regardless of this, the guide goes into a wide array of detail, starting with the first section for rookie pilots, the Imperial Pilot’s Handbook. 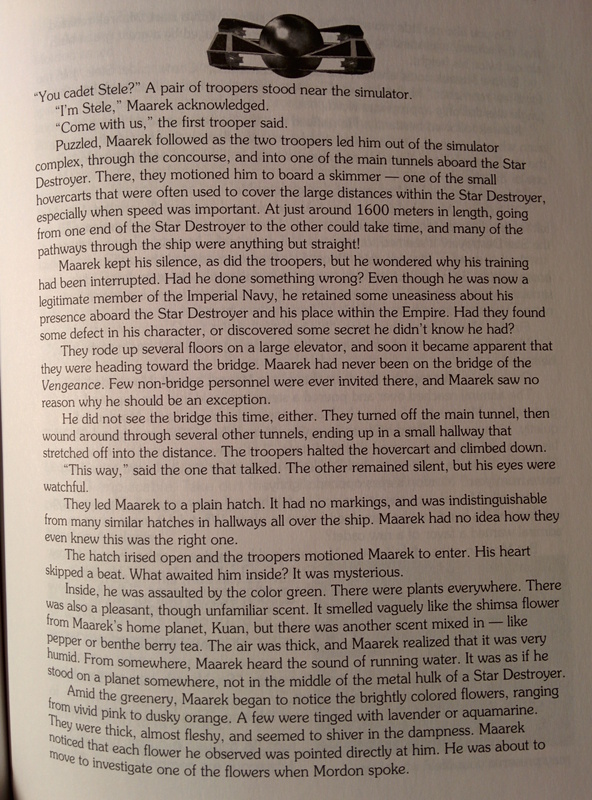 This portion of the book is a bit over thirty pages, and takes up the bulk of Part One of the manual, entitled, “Early Training.” This section goes into great detail about the various systems common to all of the ships you’ll fly, like sensors, targeting and so on, and discuss concepts like situational awareness, situational-based power settings and more. 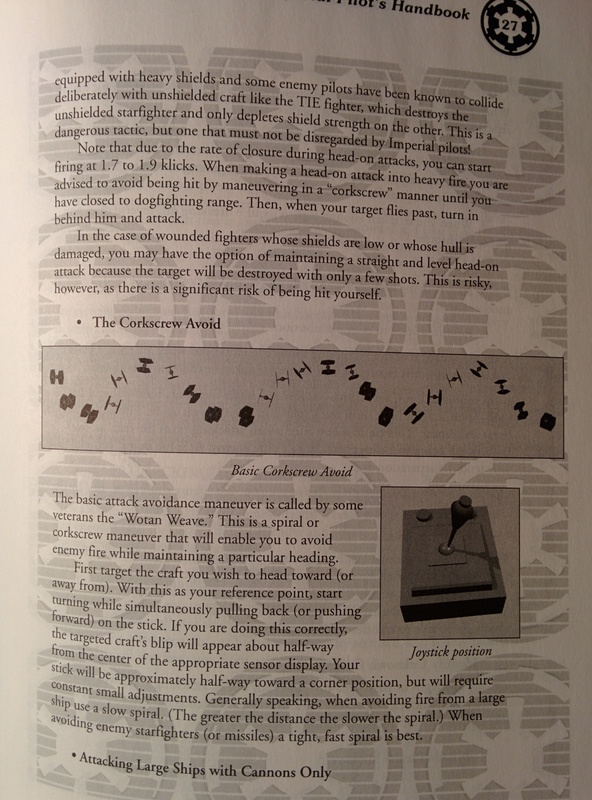 It also gives details as to certain maneuvers such as the Basic Corkscrew Avoid, shown below. Throughout this, the writing is both friendly yet authoritative, which skirts the line fairly well between “Fictional Imperial Document” and helpful strategy guide. Even though I knew much of this stuff already, I never felt like I was being talked down to or anything, which is a nice touch. 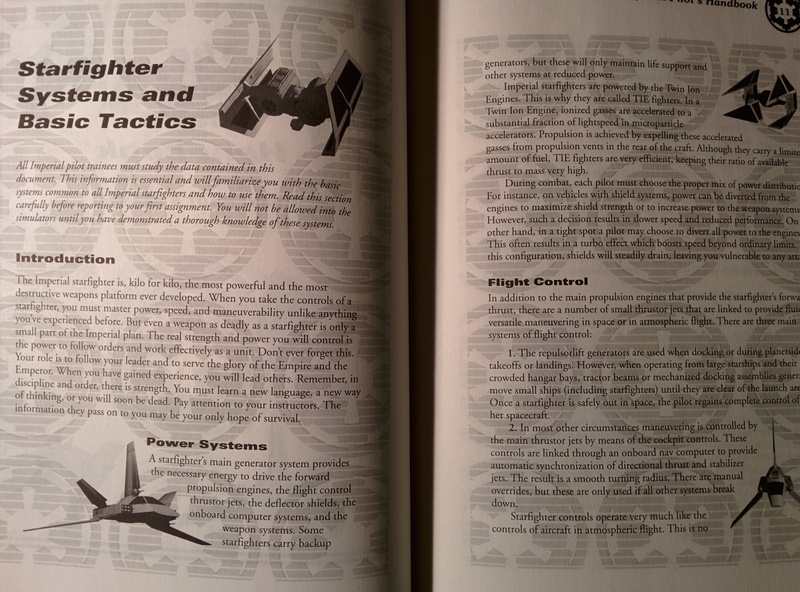 The next section of the book discusses the basic historical and training missions you can go through for each fighter, which is pretty basic stuff. It’s part three of the book wherein the real joy of this guide lies. While much of this guide gives the basic layouts of missions, along with tips, it also tells the story of Imperial Pilot Maarek Stele, whom is presumably your character in the game itself (despite being allowed to name your own character). While his/your story starts in part one of the book, with the training discussed earlier, it really takes off in part three. While the game itself tells a fantastic job of telling its story, this extra flavor given by the strategy guide is just absolutely stupendous, filling in holes in the story I didn’t even know were there. For the bulk of the rest of the guide, the missions are broken up like this: First, a quick rundown of the mission briefing, followed by any secret orders you might have. Then comes Stele’s After-Action Report, which is an anecdotal retelling of what happened in the mission itself. Personally, as I read through the guide, I could really tell a lot of work went into giving this section a voice, that voice being Stele’s, rather than simply the author’s. By making these rundowns a bit more personal, they also made them a lot more engaging and memorable as well. As I read through Stele’s reports of missions I’d already flown, I smiled as I read him sharing many of the same frustrations and such that I did as I played the game, great stuff. 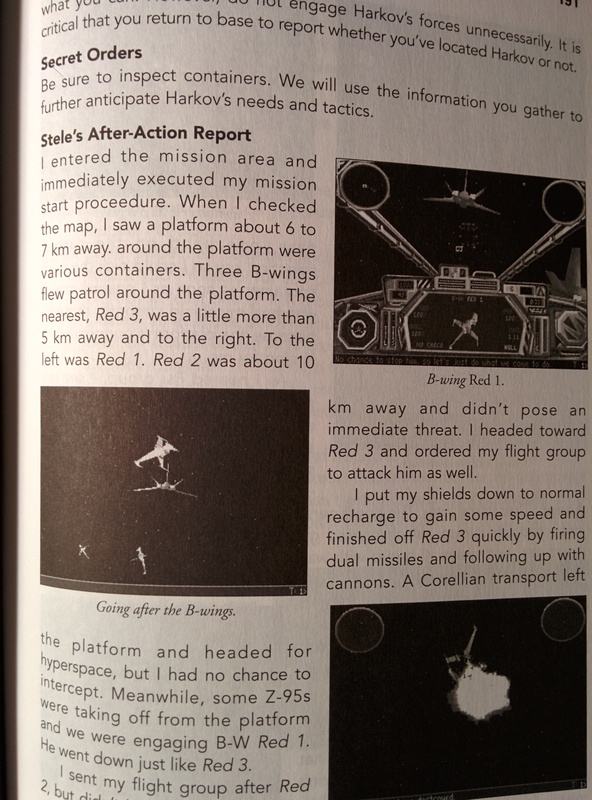 Then, for much of the guide, the After-Action Report is followed by Stele’s story itself, laid out as periods of time between the missions themselves. Again, these added a wonderful amount of flavor to the game and the book, and what I loved most about them is that, if you never read this stuff at all, you wouldn’t really lose the impact the story in the game itself had to tell. The writing in TIE Fighter stood so well on its own that this extra text just added extra layers too it, rather than taking anything away, if that makes any sense. It was like extra icing on top of an already exceptional cake. Some of these portions of the story were longer than others, but they always added a little extra something to the reading, which I loved. That is, until you get into the portion of the strategy guide that covers the two expansion packs, Enemies of the Empire and Defender of the Empire. While you still get Stele’s After-Action Report with each individual mission, that extra flavor text that made the previous portion of the guide so memorable is gone from this point. That makes about 40% of this guide much less engaging than the previous 60%. Still, it’s very well written even though it’s missing what I feel is this guide’s greatest asset: Stele’s story. Once the guide itself is finished, there are four very small appendices covering the scoring, the training sim, camera usage and the team behind the game. Overall, while this is an well-written and very useful guide for the most part — don’t worry, I’ve only read the mission stuff up to the mission I’m stuck on — it feels like it’s really two guides: one for the base game, then covering the expansion packs. The guide for the base is an exceptional read full of great writing, fun storytelling and very useful information. The guide for the expansion packs…well, two out of three ain’t bad, I suppose. If you want to check this guide out for yourself — which I highly suggest you do — you can get a PDF copy via the GOG version of the special edition. It’s definitely worth a read if you enjoy the game, even with the story abruptly ending a bit more than halfway through.